Marriage is a social institution, and of course, uniformity is essential to build and maintain it. Weddings are the most celebrated occasions all over the world, irrespective of nation, culture, and boundaries. Indians are an excited lot and treat weddings and marriages as the most promising part of their lives. 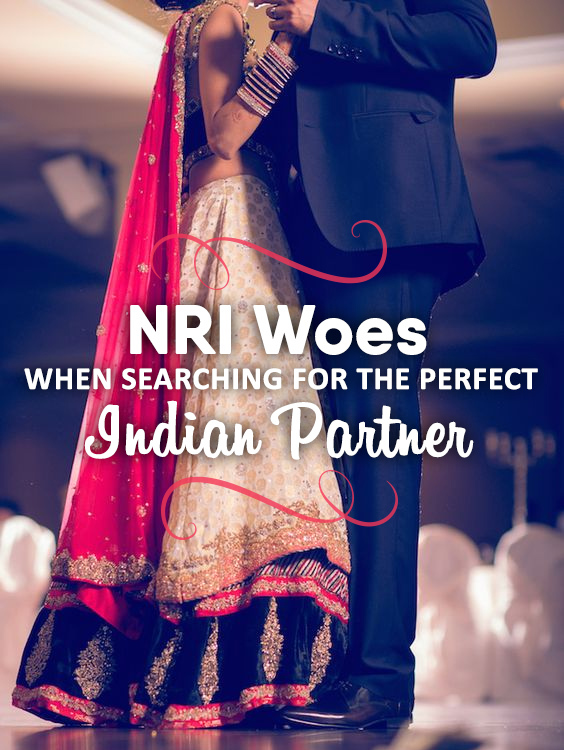 However, it can get mighty challenging for an NRI to find the perfect Indian partner! Why Is It Hard for An NRI To Get an Indian Partner? Non-residents of India find it quite difficult to marry someone from the Indian community. It is because of multiple reasons including cultural contrast, different backgrounds, upbringing, living style and most of all, the distance. It gets complex for two people with different, or to be precise, opposite cultural backgrounds. Indians have an inseparable touch in almost everything from their traditions, history, genetic influence on their faith and beliefs. They are very closed in their circle, and at times, it becomes unmanageable to gel well with the other cultures. To illustrate, Indians have a versatile culture and traditional rituals which categorize them into different castes, gotras, regions and they prefer marriage within their community. They believe in not marrying outside their religion and caste to continue making pure blooded generations without any mix-up. They also treat marriage as more of a family and community institution and less of only two individuals forming a relationship. Thus, they are rigid about educational qualification, blood backgrounds, ancestors and similar living style to make the bond stronger. Typically, linguistic boundaries also play a role of their own. Bengalis prefer Bengalis, and Brahmins do not marry outside their community. Also, marriage outside the religion is out of the question. Distance is yet another meter which limits marriages outside India. Most people don’t prefer marrying their child out of the instant reach. There is a difference in family bonds, relatives and moreover, parents. Most of the people from outside India stay independently, and thus, it’s at times hard for the person to remain all alone. Many USA & Canada Matrimony sites offer multiple options to desiring users and have thousands of Hindu grooms and beautiful brides. You can choose according to your preference regarding age, specifications, features, body type, education, and family background. Here, you can search the best profiles by filtering your choices accordingly. These sites are also mobile-friendly, and hence, you can easily access them from your smartphones. The various castes you can search for on the websites are Jain, Arora, Agarwal, Rajput, Bania, Kayastha, Khatri and others. Matrimonial websites offer hundred times more options than in the real world. It’s effortless, and most parents or persons who are willing to get married soon can register themselves by making an account on these websites, and search for their desired groom or bride. Unlike the traditional method of searching for a bride or a daughter-in-law or a groom for your child, parents can register and create a profile for their child. You can then easily arrange for meetings and calls and connect more for further rituals. Canada Matrimony Sites are quite popular among Punjabis to find suitable matches. Matrimonial websites offer many perks to its users. To start, these are verified. The profiles on the site include only verified people with approved social applications, documents and family backgrounds. Therefore, there is no chance of getting stuck with a fake profile. The verification of a person is the biggest concern for marriages, especially in the case of marriages outside India. USA Matrimony sites are one of the most trusted and reliable matrimonial websites for finding the perfect and suitable life partner. The best matrimonies also have dozens of questionnaires including choices, preferences, food taste, and more. They ask various questions about hobbies, interests, animal love, personal choices, environmental concern and others which give a more accurate idea of a person’s personality. Thus, you can use filters and approach profiles with the same interests as you. So, why are NRI’s interested in marrying Indians? Of course, the culture! The rich culture of the country, the traditions, the food, clothing, linguistic variation and most of all, the thousands of years of history are some other reasons. Indians are known to be amongst the most beautiful, intellectual, warm and diverse people in the world. It’s a nation with a versatile culture which makes it the most attractive place to visit and live in. Matrimony helps in connecting people at long distances. It is made for people who have to look for suitable matches from distant lands. The Indian NRI Matrimonial sites help in letting you connect with and approach people from a long distance and give you a chance to explore. With hundreds and thousands of profiles from outside the border, Indians, as well as non-residents of India, can find their preferred partners from matrimonial sites. These websites can be accessed from a computer system, via phone or through an application. Most of the sites are converted into mobile-friendly applications. All it requires is for you to download them from play store or app store and enjoy unlimited surfing. However, most apps charge for their premium services. With premium services, you can get 100% verified, filtered and best profiles with a high standard of educational, financial and social backgrounds. Most profiles choose only invitations from premium profiles. The membership charges vary from scheme to scheme, the number of profiles you can see, filtered profiles, number of contacts you can get each month or annually. So, if you are looking for an Indian bride or an Indian groom or NRI Brides & Grooms in the USA for Marriage, matrimonial sites are the best for you. You can install the application, log in to the site and get as many options as you want. The apps also give your friends or family the accessibility to operate your profile, connect to profiles, send invitations and accept them. Can’t wait to get married? Start your journey now! This entry was posted in Wedding Tips and tagged canada matrimony, Indian NRI Matrimonial sites, nri bride, NRI Bride for marriage, nri groom for marriage, nri matrimony site, usa matrimony on October 22, 2018 by TSILV.